The pain in my right foot that began Thursday evening and remained all of Friday is greatly relieved now. During Saturday, I was able to control pain with Tylenol. Today [Sunday] I have not had to take any Tylenol for pain relief. However, I am still pretty crippled up because when I attempt to walk, I cannot put any weight on my right foot without having extreme discomfort. A few comments from readers asked how an infection could happen to my foot without there being any wound or sore? Now I am wondering about this question too. I will phone my doctor Monday morning and find out the answer. Also, Doctor Lee mentioned the possibility of me having gout. I will ask Doctor Lee if I should have a test for gout. Doctor Lee is treating me with antibiotics for an infection in my foot. Doctor Lee did not tell me where this infection could have come from? I have no cut or sore on my foot? While I was with Doctor Lee, it did not occur to me to ask him why he felt that I had a foot infection. Doctor Lee also mentioned the word "gout" while examining my right foot. But he gave me no instructions about gout. When I told my friend John about Doctor Lee mentioning gout, John suggested that I drink pure cherry juice. John told me that he had a problem with gout, and pure cherry juice got him cured. John told me that Sprouts Market carries pure cherry juice. It may seem strange to you, but I am now able to ride my electric bike easier than I am able to walk! My electric bike is sort of like those 3-wheeled electric scooters that disabled people use. I had no problem at all biking to the Sprouts Market to buy pure cherry juice. If I had driven my Honda car to Sprouts, I would have lost my parking spot in front of my apartment house. Thursday evening, suddenly my right foot began to hurt like crazy! On the right side of that foot, in one place, it was hurting so bad that I could not do anything else. Could not sleep! Could not walk. I just stayed in bed and watched the minutes go by. I had aspirin in my medicine cabinet. But I cannot take aspirin because I am on Coumadin [Warfarin] treatment. In the morning, I asked my friend John to bring me over some Tylenol [which is OK for Coumadin]. After I took a couple of Tylenol, I began to be able to hobble around. Before that, I had crawl on my hands and knees. I made an 11am appointment to see Doctor Lee, my primary care physician at Kaiser. I hobbled to my Honda car, and drove to the nearby Kaiser clinic. Doctor Lee diagnosed the pain as coming from an infection in my foot and prescribed an anti-biotic for that. While in the Kaiser pharmacy, I picked up some extra-strength Tylenol for pain. I spent the afternoon in my LazyDay recliner with my feet elevated, as instructed by Doctor Lee. My foot still hurts, but the pain is much reduced by Tylenol. For the past few days, I have been mostly goofing off. What have I been doing? Hmmmm? Well, I have watched lots of stuff on my 50" flat screen Samsung TV. The World Cup soccer matches in Brazil. The tennis matches at Wimbledon. And a lot of other interesting TV stuff too. When I travel around my town of La Mesa, which I do every single day, I usually take my Prodeco electric bike instead of my Honda FIT car. Biking is lots more fun! I've got three kinds of plants growing in my pond now. 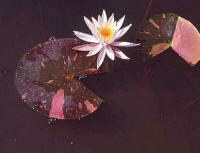 The first is the Arc-En-Ciel Lily. Then came the Horsetail Rush. This morning I've added Impatiens! First the Impatiens had their roots cleaned of soil. And then, I just dropped the Impatiens into the plastic container that holds the Horsetail Rush. If you look carefully at the pic below, you may find the Horsetail Rushes growing up thru the Impatiens. One of two leafs from the Lily is visible at the bottom of the pic. When the Lily and Horsetail first arrived, I was not sure that they would survive. Especially the Horsetail which looked soooo puny. But as soon as these plants were in the pond, they sprouted to life! Especially the Horsetail which grew in size by at least 5 inches and now stands vertical instead of lying horizontal! From my studying about ponds, I found that top soil should be used. I bought a bag of top soil from Lowe's. But it turned out to be the wrong kind of top soil! It was much too light and contained a lot of wood chips. When the container with the Lily was introduced into the pond, lots of this top soil simply floated up and around the pond! Further study showed that the kind of top soil best for my pond could be obtained from the garden around my apartment house. Also, the local Armstrong Nursery sells a soil that they have made especially for ponds. Do you see the Horsetail Rush growing from the Impatiens? This afternoon when I returned from my golf lesson, there was a package from Pondbiz.com waiting for me at my door. 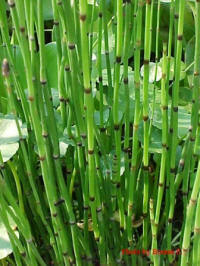 My first buy for pond plants is a Horsetail Rush [Equisetum hyemale] and a Arc-En-Ciel [Changeable Pink Hardy Lily]. Since my balcony faces northwest, it seemed that I would be mostly out-of-luck if I wished to cultivate flowers for my pond's lily plants. But then I stumbled upon a website that gave information about fluorescent bulbs that artificially provide light energy for gardeners who want to grow flowers in shady areas. Wow! It looks as though I may have "lucked out" again! Learning to swing a golf club is a very mysterious thing. Golf club swinging reminds me of learning to roll-up a kayak. Both of these things, "golf club swinging" and "rolling up a kayak" are very difficult to understand. Back in 1978, my son David and I were learning how to kayak in the rivers of the Sierra Nevada. In order to safely kayak, we had to learn how to remain in a capsized kayak and roll the kayak back up into a vertical position. In order to learn "rolling up", we went to the Sierra Club classes that were given in a swimming pool in the City of Cupertino by the Loma Prieta Paddlers, part of the Sierra Club [link]. Both my son David and I were not able to easily grasp what was going on when we tipped our kayak over and attempted to get our paddle in position to roll up. We spent hours at home on our backs on the floor, trying to figure out how "rolling-up" was supposed to be done. Finally, we both learned how to roll our kayaks. Then, we spent many years exploring the rivers of the west. I understand that learning how to swing a golf club properly is going to take me quite a bit of time. At the encouragement of my friend John, I've enrolled in a beginning golf class sponsored by the Grossmont Adult School. This class starts in July. I am very much looking forward to it. Also, John has arranged for a private lesson by the instructor of that golf class. John, his wife Mimi and I will receive that private instruction this coming Thursday. Very exciting! In the meantime, I've been spending considerable time watching a video on YouTube in order to learn the "One plane backswing" [link]. Back in 1995 I got a job at the Emminger Company as an apprentice cabinetmaker in Pittsburg, California. There was another apprentice working there. He was young, only about 20 years old. He had long hair. And he was a fan of Kurt Cobain and the Grunge Band, Nirvana. At first, I hated Nirvana's music. But slowly I began to like it! Hmmmm? Soon I bought Nirvana Cds. Now I am living in my La Mesa apartment. There is a wonderfully large bath tub here. I like to listen to music while soaking in the hot water. I bought myself a small JBL stereo speaker that has Bluetooth capability. I am able to go to YouTube, search for a Nirvana album that I like, and transmit the music from my MacBook computer to the little JBL speaker in the bathroom using Bluetooth. This morning I listened to to Nirvana's "Unplugged In New York" [link]. Pretty neat! I went for lunch to the Sizzler in El Cajon. This is about an 11 mile round trip with an elevation rise of over 300 feet. I likely would not do this trip if I did not own an electric bike. Too much like work! However, being an electric bike, my Prodeco Mariner 7 is a joy to ride. This particular Sizzler is my favorite. Some of the newer Sizzlers have changed their menus so that a senior steak is only a 4 ounce size. This Sizzler in El Cajon offers a 6 ounce senior steak. Perfect! Since I last blogged to you, I've got some new stuff! On my balcony is the beginning of a pond! Yes, a real pond! It's fashioned from a 70 gallon Rubbermaid tub. So, you have to use your imagination at this point to see a pond there instead of just a black plastic tub. Since I don't have a water hose in my apartment, I'm filling this tub with a 2-gallon watering can. The tub is about 1/2 filled with water now and it has taken me about 3-days for this filling. I usually fill only about 2-watering cans of water at a time. That's why the filling takes so long. I've ordered some aquatic plants to grow in my pond, but they have not arrived yet. Soon, I hope. Nearly every day I bike over to the nearby Sun Valley Golf Club to practice on their putting green. My thinking was, to get putting down solid, and then move on to chipping, pitching and finally hitting off the fairway and driving. Well, I now believe that I have to change that thinking. Because there is really nothing in golf that anybody gets down solid including me. And that includes putting. I am going to have to reconcile myself to practicing all parts of golf and hopefully get somewhat good at all of those parts. After that, I might be able to go play golf with friends. I used to think of myself as being kind of tech savvy. Back in 2003 when I began blogging, I also published stories which I wrote in HTML code [link]. I fancied myself as an "advanced" kind of guy. I not only knew how to write in HTML, but I used File Transfer Protocol [FTP] to upload that code on to my website for all to read. But man-o-man, have I been left behind. The tech world of communication has zipped along! I now am in the stone-age compared to little children using their smart phones. A few weeks ago I stopped using my ancient 6-year old iPhone 3g and got a new iPhone 5s from AT&T. When I got this new iPhone, it was not clear to me even what an App was. Wow! Did I have a wake-up call. The first thing that I stumbled upon after beginning to use my new iPhone 5s was "LastPass" [link]. This is a fantastic App program that keeps track of passwords, user names and links to all of my stuff such as; bank accounts, stores where I buy things, San Diego Gas & Electric, etc. For $12/year, I subscribed to LastPass Premium. With LastPass Premium, changes that I make to LastPass on my computer are automatically available to me on LastPass on my iPhone 5s. With premium, my MacBook Pro and my iPhone 5s remain in sync. This is a fantastic program which I use many times, each and every day! A Bar Code Reader called "RedLaser. Now I am able to scan product codes in stores in order to learn the actual price. A GPS navigation App which locates my car in a parking lot. This App is called, "Find My Car". When I park, I set the location using my "Find My Car" App. When I am finished shopping, I walk to the mapped location of my Honda. No more lost cars [or bicycles either]. Just this afternoon I got the "Fandango" App, which tells all the movies that are playing near my apartment and even allows me to "buy" a ticket to a movie. The "purchased ticket" is downloaded to my iPhone 5s as a QR code [link]. When I go to the movie theater, there is no standing in the ticket line. I just walk over to the ticket taker inside the movie theater and hand over my iPhone with the QR code showing. The QR code is scanned, producing a printed ticket. It is sooooo easy! It may not be easy for you to acclimate yourself to the world of Apps! It took me a couple of days messing around to get myself to understand LastPass. Even Fandango took a few hours. Yes! My new set of Strata brand golf clubs were delivered by the UPS guy this afternoon. These golf clubs are sold by the Callaway company. One of the most popular golf companies! The clubs are gorgeous. If I ever get as good at golf as these clubs look, I will be one hell of a golfer. I've been studying putting by looking at videos. Now I have my own putter! So, I put my new putter in my backpack, climbed on my Prodeco electric bike, and went over to the nearby Sun Valley Golf Club to practice my putting. Wow! I learned something. Putting is really hard to do. Here is what my balcony garden looks like this morning at 7am. What a good time! I just returned from a bike ride with my friend John P. We drove to Mission Beach in John's little Mitsubishi Miev electric car. Then biked up to Pacific Beach. There are a lot more people on the beach now than there were only a few weeks ago because it's the beginning of the summer season. 6PM - Where's my bike? It's time to go grocery shopping. I'm driving my Prodeco electric bike to the nearby Von's market. I always park the bike in the same place. Attached by a cable to one of those "Disabled" blue parking signs. After shopping, I returned to my bike, and the Prodeco was gone! Somebody had stolen my bike! Could I have parked it in another place? I looked around the lot, and sure enough, my bike had been actually stolen. I went inside the store and asked at the service desk for the police phone number. The police phone notified that somebody would be with me soon. The police line was busy with somebody else right now. I went thru in my mind what had to be done. I'd have to report the bike stolen to my insurance company. Also, buy another bike. My backpack was filled with groceries, and the pack was heavy. So, I took off the back pack and put it into a shopping cart while waiting for the police to answer the phone. That's when I spotted my electric bike!! It was parked one aisle over, cabled to another blue disabled sign. Wow! Am I happy to see my bike again! I've not blogged for a few days. But I have been doing things every day. Mostly golfing, gardening and biking. With my golfing, I've not even stepped on to a golf course yet. However, I have been studying golfing a whole lot. My thinking is to begin with and focus completely on putting. Fortunately, there are a ton of videos about putting. Nearly all the golfers who make videos have different ways to putt. What I want to come away with from watching putting videos, are things to try when I finally go out to practice putting on a real green. Yesterday, I ordered a set of golf clubs made by Callaway. These clubs are Callaway's Strata 13-piece set [link]. My clubs are on the way! This morning my new clubs pulled out of Dallas, Texas! Every day I visit gardening stores. There are a lot of gardening stores not too far away from my Guava Gardens apartment. Several are at big stores such as WalMart, Home Depot & Lowes. There are lots of smaller gardening stores, such as Armstrong and Hunter's Nursery. I am able to ride my Prodeco electric bike to visit most gardening stores to do my shopping. For actual buying, I return with my cute little Honda Fit which has a ton of hauling space in the back when the rear seats are folded down. Yesterday evening my left foot was hurting sooooo bad that I was thinking that I might have broken a bone in that foot. You may recall that I've been diagnosed by Kaiser as having "Osteoporosis" [low bone mass]. I am taking prescribed medication in order to prevent this disease from continuing. Last night this pain was sooooo intense, that I had a great deal of trouble just walking to the bathroom. Trying to fall asleep was almost impossible. But, I finally did fall asleep. When I woke up this morning, I tentatively got up to walk around my apartment. The pain was almost gone! This morning I biked around doing my errands and had no pain at all. Just now I probed the areas of last night's pain with my fingers, and could feel nothing! I bought this garden display shelf from Overstock.com. Very easy to assemble, especially if using an electric screw driver. Click [here] to see this shelf.